Arsenal claimed their third consecutive victory in the Premier League with this hard-fought win over Newcastle at St James’ Park. It’s the first time since May 2017 that the Gunners have won back-to-back away games, as the players look to be finding their feet under head coach Unai Emery. After a frustrating opening period, the visitors returned from the break in determined mood – and, only four minutes into the second half, Granit Xhaka broke the deadlock with a superb free-kick from 25 yards. Mesut Ozil doubled Arsenal’s lead with his first league goal of 2018; although Ciaran Clark grabbed one back for the Magpies in injury time, it was too little, too late for a team still seeking a first league win of the season. Newcastle set up in a 4-4-2 formation, with Mo Diame and Isaac Hayden operating centrally. 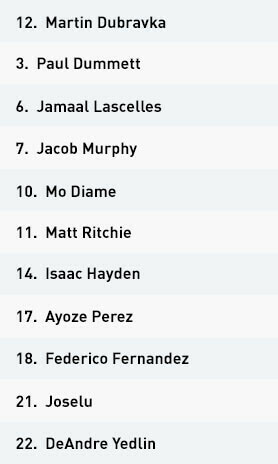 Matt Ritchie and Jack Murphy played in the wide areas, while Joselu and Ayoze Perez, who sat a little deeper, formed the front two. Rafael Benitez’s players saw very little of the ball, and the majority of the time they spent in possession was of a transitional nature, rather than consisting of any quality build-up. They displayed a desire to play forward early upon regaining possession – preferably within the first two passes – and attempted to hit Arsenal on the counter-attack. Additionally, they would play the ball into Joselu or Perez’s feet to allow the pair to set the ball back to a forward-facing midfielder, who would then play a penetrative pass for a third-man run. 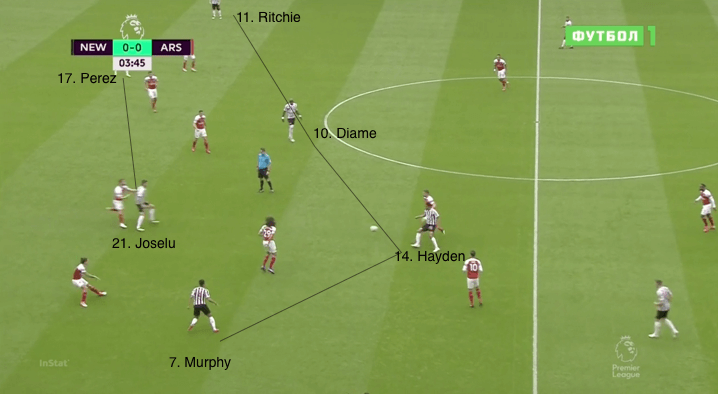 A lack of speed and poor technical quality meant that this strategy never really threatened the Arsenal back line, though, with the ball either getting stuck under the setter’s feet or the ensuing pass proving inaccurate. They operated in the same 4-4-2 formation out of possession, which simplified their transition from attack to defence. The back four were kept occupied by three Arsenal forwards, so they remained narrow while the whole team attempted to protect the central areas. For the most part, they set up in a 4-4-2 mid-block, waiting patiently for specific moments to apply pressure.  When the ball was in a central area in front of the block, the Newcastle players would allow their opponents to have the ball. 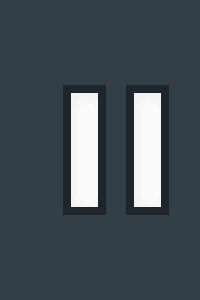 As soon as the ball was played into a half-space or wide area, the near-side forward and the wide midfielder would press in front to prevent any forward options. If the ball went into the feet of an attacking midfielder, such as Mesut Ozil or Granit Xhaka, the central midfielder on that side (Hayden or Diame) would press to prevent him from turning. The hosts would also aggressively press Arsenal when they were building out from goalkeeper Petr Cech, and try to regain possession as close to their opponents’ goal as possible. 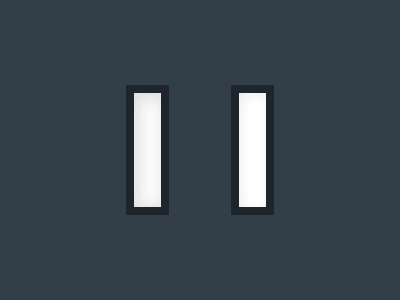 If the press was broken and the distance from the nearest man to the ball was too far, they would retreat into their mid-block. It was an improved performance from the Magpies, with Arsenal limited to only two shots on target over the 90 minutes. Unfortunately, both of these efforts found the back of the net, leaving Benitez and his players with only one point on the board after five matches. Newcastle set up in a 4-4-2 in possession and would look to play forwards as early as possible upon regaining the ball. Newcastle used an organised 4-4-2 mid-block out of possession, and focused their efforts on protecting the central areas. The Magpies would aggressively press Arsenal from their goal-kicks and try to force errors from Petr Cech and his defenders. Arsenal set up in a 4-3-3 in possession, with Matteo Guendouzi, Granit Xhaka and Mesut Ozil forming the midfield three. 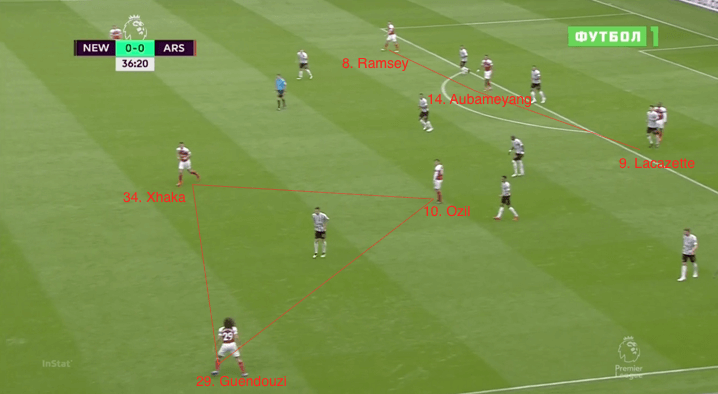 Arsenal used several structures out of possession. 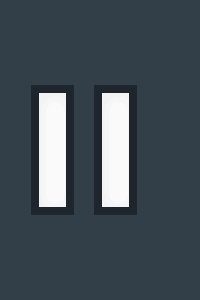 Here, we see a 4-2-3-1 system, where Ozil has been released from the midfield three to form an advanced trio alongside Aaron Ramsey and Pierre-Emerick Aubameyang. One of Arsenal’s weapons was to move Ozil inside when play was on the opposite flank, before transferring the ball across quickly. This allowed right-back Hector Bellerin to make forward runs out wide. 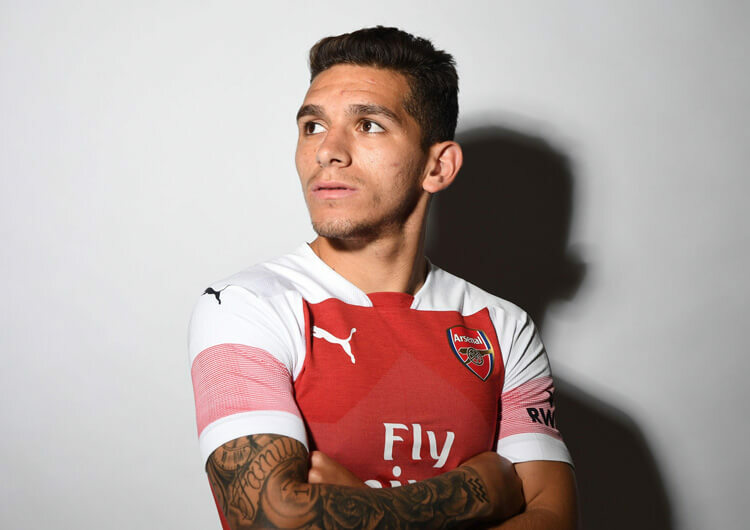 The introduction of Lucas Torreira gave Arsenal more balance and quality in the midfield, as Ozil could now operate more as an attacking midfielder rather than dropping deep to help with the build-up. 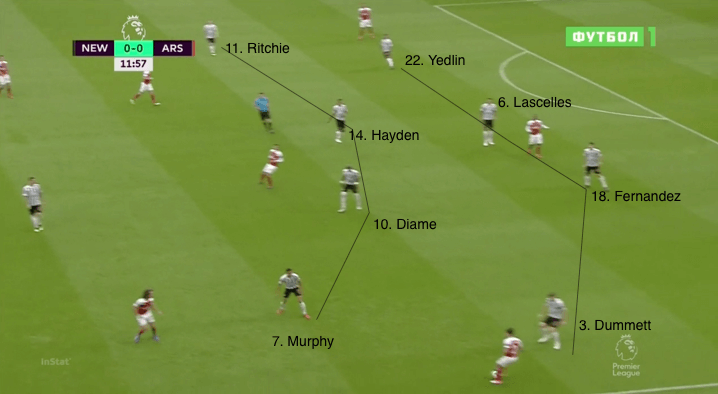 Arsenal found a solution to their opponents’ block by using three players in the wide areas to pull the Newcastle defenders out of their slots and create gaps to play through. This was integral to the build-up for the second goal, eventually scored by Ozil. Arsenal set up in a 4-3-3 formation, with Matteo Guendouzi, Granit Xhaka and Mesut Ozil playing as the midfield three. 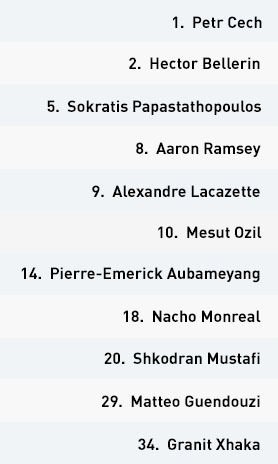 Aaron Ramsey, Alexandre Lacazette and Pierre-Emerick Aubameyang operated as the forward line, with Lacazette mostly used as the central striker. In possession, Unai Emery’s players tried to build from the back. 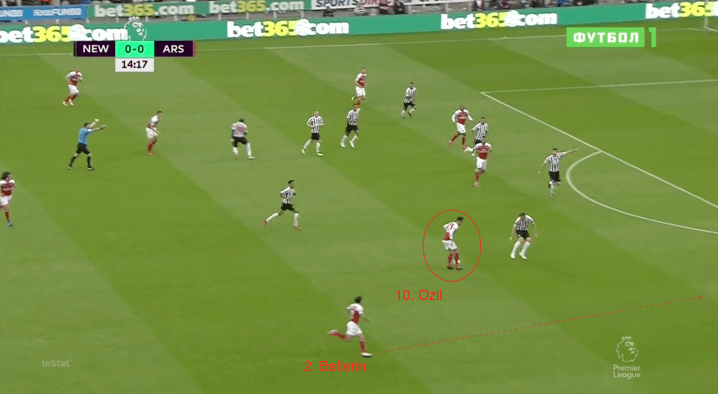 They would often position Guendouzi between the centre-back and full-back on one of the two sides, allowing the full-back to push higher up the field and exploit the wide areas. 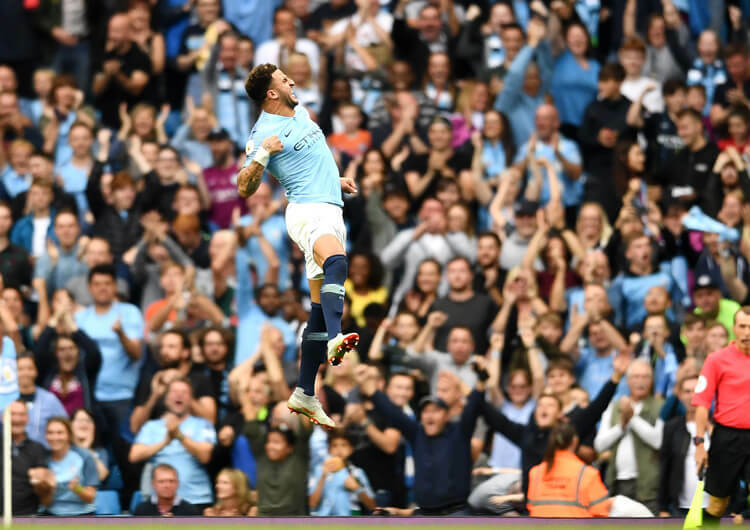 They struggled to break their opponents down for the majority of the game, however, with their overloads generally forming in areas of the pitch that didn’t hurt the hosts. As the front three played narrow, they effectively pinned the Newcastle back four – but they ran into difficulty in central areas. The hosts’ central midfield pairing had only Xhaka and Ozil to worry about between and beyond their midfield line, and this in turn made it easier for the wide midfielders to pick up full-backs Hector Bellerin and Nacho Monreal. The overload frequently came in front of Newcastle’s block, causing them very few problems. To combat this, Ozil moved inside, between the central and wide midfielder when the ball was on the far side. As the wide midfielder was forced to tuck in to pick up Ozil, space opened up for right-back Bellerin to become the free man. 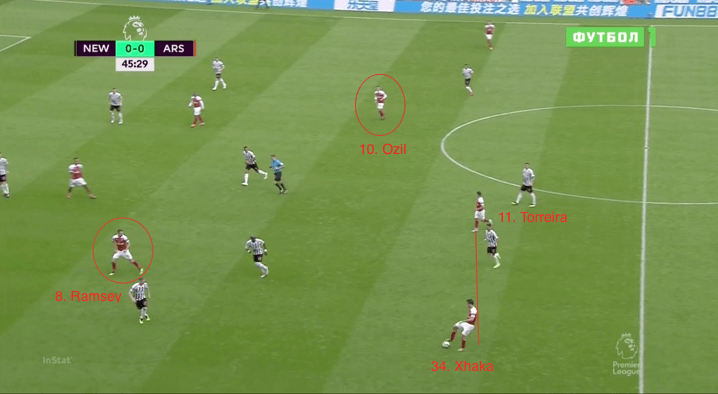 Similarly, Arsenal also occasionally used three players in the wider areas – particularly on the left side, where the relationship between Monreal, Ramsey and Xhaka troubled a Newcastle defence struggling to balance tracking runners with remaining compact. This approach was crucial to the build-up for the second goal, eventually scored by Ozil. Away from this, it was a fairly ineffective performance from the front three. 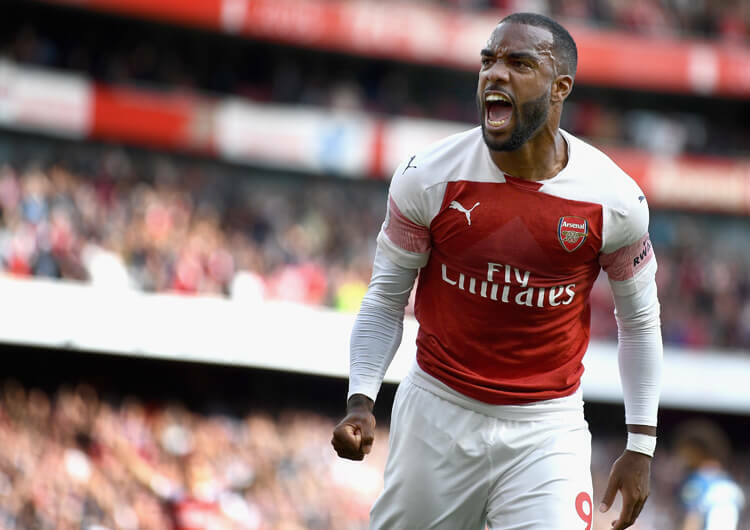 Lacazette and Aubameyang notably struggled to influence the game, with the former finding it difficult to secure the ball when it was played into his feet and the latter inconsistent in his deliveries. The visitors’ balance and quality improved after the break, when Lucas Torreira replaced Guendouzi – his presence allowed Ozil to take up more advanced positions, rather than coming short to offer his assistance in the build-up. 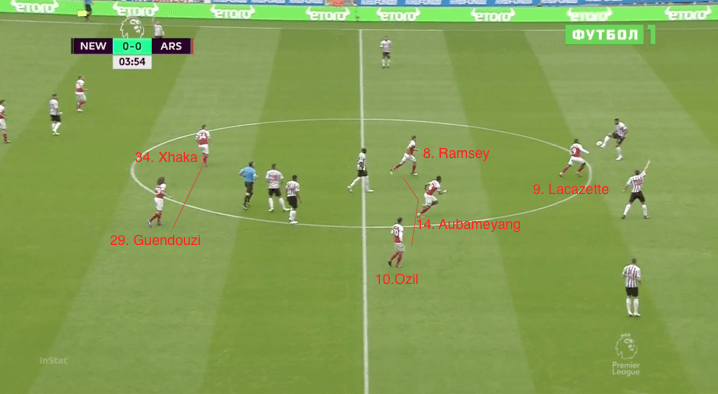 Arsenal spent very limited time out of possession, but their structure took on several forms. They would occasionally operate in a 4-2-3-1, where Aubameyang or Lacazette would lead the press, with support provided by the other two forwards and one central midfielder (usually Ozil). Other times, they would remain in their 4-3-3 system. Regardless of their structure, their aim was to try to regain possession as quickly as possible. They demonstrated an effective counter-press, packing bodies around the ball once possession had been lost in order to prevent their opponents from gaining any moment in building or launching an immediate counter-attack. The Gunners remain a work in progress under Emery, but three consecutive wins after a difficult start suggests the players are starting to respond to the fresh style and philosophy being implemented by their new head coach.